WEISER — After Emilly Perez graduates from high school next spring, she will leave the town where she grew up. Definitely for college. Possibly for good. Idaho’s geography — and miles of hilly, serpentine two-lane highway — separates Weiser from a college campus. A social divide also stands in the way. It’s harder to see and possibly harder to cross — and symptomatic of much of rural Idaho. A farm-based community on the Idaho-Oregon border, Weiser has few jobs that require a college education. Many of these jobs are at the local hospital, or with the Weiser School District. Consequently, only 11 percent of Weiser’s adults hold a bachelor’s degree or higher, according to the U.S. Census Bureau. The median household income, $31,343, is less than two-thirds the state average. “It’s tough for families here … to assume the kind of debt it takes to send their kids off to college,” district Superintendent Wil Overgaard said. Nearly a third of Weiser’s 5,365 residents are Hispanic. Statewide, Hispanic college graduation rates remain well below Idaho’s lackluster overall numbers. Of course, some students do leave Weiser for college. Some go far, as evidenced by the row of felt college pennants that adorn a hallway at Weiser High School. But these college-bound students remain a minority. By the district’s count, about 40 percent of the school’s 121 graduates went straight to college in 2017. For some, college is part of their family’s history. Principal Dave Davies’ son graduated from Weiser High School in 2018; three months later, he began his freshman year at Harvard University. Berke Walker, the son of two school district employees, will enroll in college in a couple of years, majoring in mechanical engineering. First, he will serve a religious mission. “It’s definitely an expectation to go to college, and to some extent to go on a mission,” he said. Other college-bound students are charting a new direction. Perez will be a first-generation college student. So was Lucia Carbajal, a 2013 Weiser graduate. She left to get her undergraduate degree at Arizona State University. She’s at the U of I’s Moscow campus, enrolled in medical school under the multistate WWAMI medical program. Dual credit can help a rural high school bridge the gap to a college campus. Weiser also tries to turn its small size to its advantage. The high school handles all class registrations face-to-face — a time-consuming process, even in a small school — in order to provide a “personal touch,” Davies said. Weiser also emphasizes the diverse opportunities a small town can offer, from dual-credit calculus to agriculture classes to band and choir. “When they do leave, they’re pretty grounded,” Davies said. But when graduates do leave, they often leave for good. Walker says Weiser means a lot to him, and he loves spending time outdoors. But he plans to use his engineering degree to pursue a career in aviation, and doesn’t plan to return home. Senior class president Mia Stender grew up in Weiser city limits, and describes herself as “the city girl who somehow emerged into the big ag girl.” She started raising beef cattle in eighth grade, despite her mother’s reservations, and plans to study agriculture education at the U of I. It’s a career choice that she could pursue in Weiser, but she says she’s looking at settling in Oregon or Wyoming. Carbajal doesn’t say she plans to return to Weiser. But when she talks about what she wants, it sounds more than a little like Weiser. At Arizona State, she had the chance to meet students from across the world: Thailand, Mexico, England. She says it was a great part of the college experience, but when she graduates from medical school, she wants to practice in a small town. Perhaps an area in need, a town that has no doctor who speaks Spanish. Perhaps a town in Idaho. “I know I want to stay in the area,” she said. 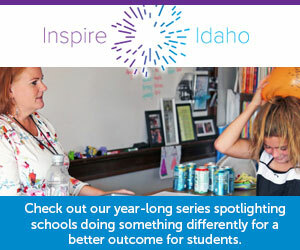 In order to reach its “60 percent goal,” Idaho will need to reinvent itself. And rethink success. In Weiser, graduates look at going on — and, probably, moving out. Idaho has spent $133 million, and counting, to help high school graduates continue their education. Will all this money bridge Idaho’s demographic gaps? Or reinforce them? For Hispanic students — Idaho’s largest minority — college access often hinges on college affordability. In rural communities, career-technical education emerges as a pathway to the workplace — and a way to make college more affordable. In Mini-Cassia, a competitive labor market creates a unique learning opportunity for students. The 60 percent goal defines a target, while trivializing the challenge. In many households, education beyond high school is seen as unaffordable and unnecessary. Native American students lag behind their classmates on many education metrics — but there are glimmers of hope. Elementary school principal Wade Wilson will take over the top job on July 1, succeeding retiring Superintendent Wil Overgaard.